With the warm water of the Indian Ocean and unspoilt marine and coral life, the waters off KwaZulu-Natal have some of the best places to scuba dive — not only in South Africa, but in all of Africa. With a variety of marine life including eels, sharks and turtles, complemented by calm seas and excellent visibility, anyone who scuba dives in this region is in for an eyeful of underwater activity. There are two main dive areas just a few hours outside of Durban: Aliwal Shoal and Sodwana Bay. Both areas have various unique and exciting dive sites for all levels of scuba diving experience. With many resorts, hotels and lodges in these areas offering both accommodation and scuba diving facilities and rental equipment, you’ll easily find a place to call home during your stay in either area. If you are not a qualified scuba diver, most accommodation options with dive facilities also offer PADI certifications. 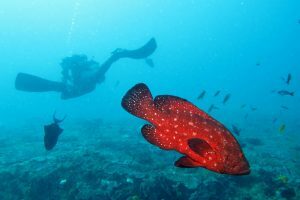 Here is everything you need to know about diving in Sodwana Bay and Aliwal Shoal. Sodwana Bay is 350km north of Durban and is home to the most southerly coral reef in the world. The town itself has a host of restaurants and accommodation options that cater to scuba divers and scuba excursions. The spectacular coral is complemented with calm and 20 to 28 degree warm water, and visibility of 10 to 50 metres. 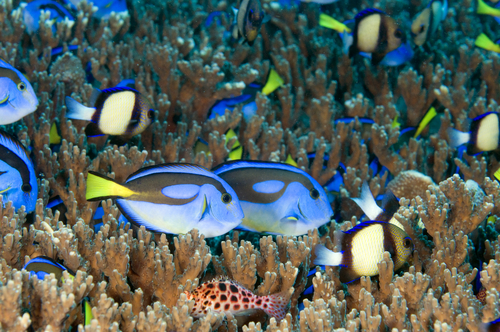 With over 1200 species of fish and 95 coral species there is plenty to see in Sodwana Bay. Sodwana Bay Lodge: What is unique about this lodge is that it has an onsite scuba centre which is a PADI 5 star IDC centre. The centre offers training for new divers and certification upgrades for experienced divers. The lodge has wooden, thatch roofed chalets with everything inside that you can expect from your standard hotel room. It is clean and comfortable and offers guest a great place to relax after a day of diving. Coral Divers: Made for scuba divers, Coral Divers offers accommodation and catering for those wanting to go on multi day dives. Accommodation offered are safari tents and standard cabins which have communal bathrooms that serviced (there are also standard cabins with private bathrooms at a additional price). Coral Divers also offers PADI scuba diving courses. Hotspot: Hotspot is a boat dive that is just south of the dive site 5 Mile. Reaching depths of 30 metres you can expect to see whip coral, tiger sharks, gold fusiliers and hawkfish. With caves to explore and pinnacles to view, divers are in for an amazing dive. Uniforms: Situated in coastal dunes and part of the well preserved iSimangaliso Wetland Park, this dive site is known for its coral diversity. The dive site is about 45 meters long and 50 metres wide and is best dived between April and September. During the months of December and January divers can view turtles laying their eggs. 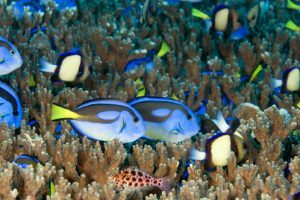 On this dive you can expect to see angelfish, purple butterfly fish and yellow tail fish. Quarter Mile Reef: Situated 14 metres inshore is Quarter Mile Reef. The dive site can only be dived in calm conditions and is an advance dive spot. In summer it is home to ragged tooth sharks and these harmless sharks come within inches of divers. The dive site is also home to large rays, morays, turtles, Kingfish and Barracuda. The Bikini Reef System: The Bikini Reef System is three reefs (Hopscotch, Bikini and Mellow Yellow) that interconnect. With depths between 18 and 24 metre, the reef is home to frogfish, paperfish, scorpionfish, garden eels, starry morays, dragon morays and ghost pipefish. It is also a great area to do macro photography. This boat dive is an advanced dive and is perfect for nitrox. Accommodation and dive schools can be found in the coastal town of Umkomaas, which is home to the launch site for Aliwal shoal situated under the Umkomaas bridge on the river mouth. Aliwal Shoal lies three to five kilometres offshore and has excellent visibility due to the warm Mozambique current. 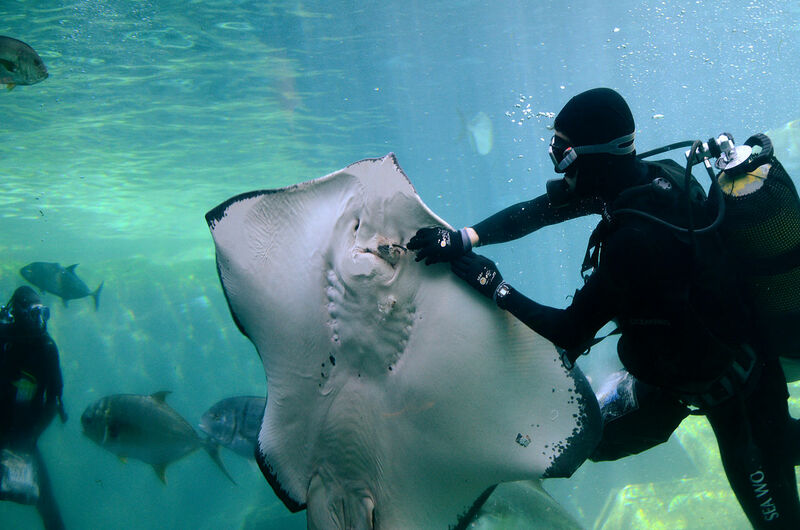 With a variety of different fish species, eels, rays, turtles and sharks, the shoal offers divers an eyeful of activity. Thousands of divers head to this area to dive at this 1.2km shoal. ScubaAddicts Lodge & Dive Centre: This beachfront dive lodge is situated in Umkomaas and over looks Aliwal Shoal. Every room at the lodge has an ocean views contrasted by miles of sandy beaches. The onsite centre means you can roll out of bed and head out to the shoal. Sea Fever Dive Lodge: Just minutes away from the Aliwal Shoal launch site with 180 degree sea views, is Sea Fever Dive Lodge. 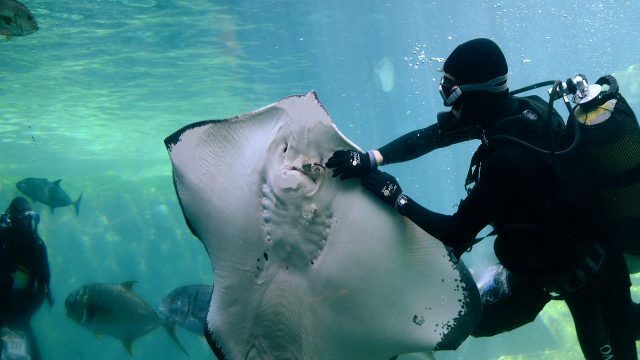 In partnership with Oceanworx Dive Charters, Sea Fever Dive Lodge offers scuba diving for all levels of experience. The lodge offers standard en-suite rooms for two people and family rooms which sleeps five people. There are also self-catering units that sleep between four and 12 people. Raggie Cave: Situated off the shore of Aliwal Shoal is Raggie Cave, also known as Shark Alley. The cave was given its name due to high number of shark sighting in and around it. From June to November you are most likely to see Ragged Tooth Sharks and from December to May you could see a Tiger or Hammerhead Sharks. After launching from a river month by rigid inflatable boat, it takes you 50km (about a 20 minute ride) off shore to the dive site. With between five and 40 visibility and water no colder than 19 degrees, this dive is ideal for both beginners and experienced divers with depths between six and 18 metres. Tiger Cover: Part of the inside edge of the reef, Tiger Cove has an average depth of12m with a maximum depth of 18m. The area is made up of a huge overhang that has formed a cove and was given its name due to the large number of Tiger cowries found in the area. The walls of the cove are covered in amazing coral and there is plenty of fish species to see including stonefish, scorpionfish and various rays. Chunnel: When diving at the 17m deep Chunnel, divers can expect a cave filled with ragged tooth sharks and tropical fish. The cave is not well lit up making it quite scary to dive into, but beautiful if you decided to go in. The dive is for more experienced divers who can expect to also see turtles, scorpionfish, ribbon tail rays and sand sharks. Northern Pinnacles: With a bunch of pinnacles in and around Aliwal Shoal, divers can expect to find many ship wrecks in the area. This shallow dive site (around 17 metres) has gullies, caves. overhangs and a big hole to swim through. The dive is perfect for beginner divers and there is plenty of marine life to be seen underneath the surface. This article was originally published November 12, 2014.